Garden retail centers would naturally know the kind of colourful flowering plants that could entice their customers during the festive seasons! In our tropical country, Malaysia, especially during the Chinese New Year in January or February, Kalanchoe blossfeldiana is a must in their list of favourites, besides Florist’s Gloxinia, Jerusalem Cherry, African Daisies and Violets, to name a few. We’ve always been charmed by the colourful display of Florist Kalanchoe during those times. What an amazing feast for our eyes! Such brilliant and splendid colours, and bountiful blooms and buds in countless clusters as well! In the temperate countries though, their beautiful and charming flowers will explode in psychedelic colours, primarily in winter, hence its name, Christmas Kalanchoe. Here again, it’s the work of professional growers who knows how to get them to flower for the festive season to be marketed widely. Nonetheless, it is known to flower during other times too, even year round with the right culture and climate. We’ve planted this succulent twice previously, but inadvertently killed it due to overwatering. John and I may probably attempt a third time since we’re a little wiser now having researched about its culture! 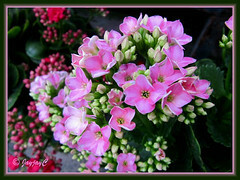 Features: Kalanchoe blossfeldiana, a species of the genus Kalanchoe, is a herbaceous succulent plant with numerous hybrids and varieties, varying in sizes and floral colors. It is moderate-growing, with glabrous stems and can reach to about 30-45 cm tall, depending on the variety. It produces dark green leaves that are oval to oblong-ovate in shape, fleshy and waxy, with scalloped margins. Blade-size vary, ranging up to 7.6 cm in length and 3.8 cm in width. In marvelous contrast, dancing above its green foliage and emerging at terminal stems, are long-stalked flowerheads with 20-50 small and brilliantly coloured flowers. Colours are so extensive and in various hues of red to scarlet, magenta and pink, or purple to orange, yellow and white. The pretty flowers can be of the 4-petaled single flowering variety as seen in the two images above or the double flowering type with many petals as photos illustrated below. It has a long blooming period that usually lasts between 4-8 weeks. 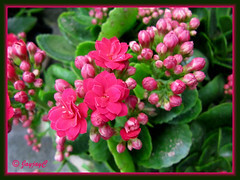 Culture (Care): Kalanchoe blossfeldiana or Florist Kalanchoe are easy to grow and needs minimal care. With the right culture, it can be so rewarding, flowering in abundance all year round in the tropics and seasonally in the cooler regions. Light: Requires good light to do well, best with morning sun or very bright indirect light. Plant becomes leggy, weak and may not flower with insufficient light. Thrives well in moderate to warm temperatures but frost sensitive. Moisture: Water well and carefully, allowing the soil surface to dry between waterings. Leaves can rot if overwatered or shriveled when underwatered. 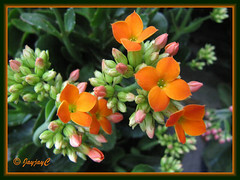 As succulent plants, kalanchoes need no misting as they can tolerate low humidity. Soil: Use a succulent or cactus soil mixture. Alternatively, any potting medium with a generous mix of coarse sand for good drainage will do. A fast draining soil mix is essential. Others: To encourage the plant to flower for an extended period, remove older flowers as they wither and new ones open, and since flowering emerge at terminal stems, beneficial to snip off 1-2 sets of top leaves as well to promote new growth. After flowering season is over, cut back the plant as low as you wish to maintain its compact size and shape, as well as to encourage bushiness. Then, feed once monthly during the growing period with a balanced fertilizer. Kalanchoe blossfeldiana is photoperiodic, whereby its blossoming is dependent on the duration of its daily exposure to light and darkness. To encourage budding, give the plant 10 hours of daylight followed by complete darkness (preferably 14 hours) every day, over a period of two to three months, during which no feeding is required. Once the new buds emerge above the leaves, the night darkness can be relaxed. Some gardeners prefer to start new plants again from leaf or stem cuttings which can be so easily done rather than keeping plants that have already flowered. Kalanchoes are generally free from pests, but do check occasionally for mealy bug and aphids. Read more about potential problems with this succulent at GardenGuides.com. For temperate regions: Hardiness: USDA 10-11. 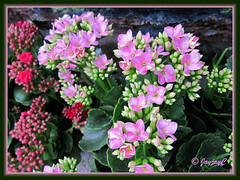 Kalanchoe blossfeldiana tolerates temperatures from hot to just above freezing and is frost sensitive. Water and feed the plant as normal during the growing season in spring and summer. Then, from mid-fall, stop feeding and provide it 14 hours of continuous darkness every day to encourage it to start budding and should be blooming when winter approaches. Propagation: Easily propagated by leaf cuttings or stem cuttings that root easily in soil. Also, can be grown from its very tiny seeds that germinate better with light and will take about 9-10 months to mature and flower. 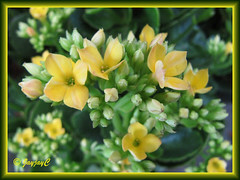 Usage: Kalanchoe blossfeldiana is excellent as an ornamental potted indoor or house plant to decorate and beautify your home, office or greenhouses. Great too as container plant for decks and patio by itself or in mixed plantings with other succulents and cacti for added colour and interest. Can be ground-grown in garden beds in the tropics or frost-free regions. 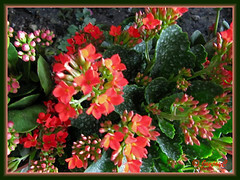 Thank you for that information – I have been pinching bits off my kalanchoe and spreading them around the garden to fill in odd bare spots. I was sure it would start to flower soon. funny that you mentioned the long hours of darkness it needs – now I remember it flowered the same time as my pointsettia! Soon I will have lots of red in my garden! It’s a gorgeous plant, but somehow they never look quite as good in my garden beds as they do in pots at the nursery. Gillian – You’re most welcome..our joy in sharing! May your plants give you lots and lots of blooms and brighten your days. Reds are such teasers, I love them all! Bernieh – Same experience over here! We garden for pleasure whereas for the garden retail nurseries, it’s a business and plants have to look their best! Hehe…now, you know why I bring along my camera whenever I visit any nursery! 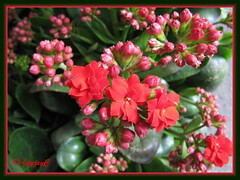 My Kalanchoe is growing splendidly, lush, verdant, and very happy little plant, but it refuses to bloom. I’ve had it about 3yrs now and after that first flush of color, it hasn’t done it since. I’ll try the advice of mid-fall starving it of light and see if I can get those orange petals to show up. All the best to you, Joy!